7 20 DOCTOR WHO: The Five Doctors. A special adventure to celebrate the 20th anniversary of the sci-fi favourite, bringing in lots of the Doctor's old chums and a fair number of his monster foes, including, of course the trundling terrors themselves. 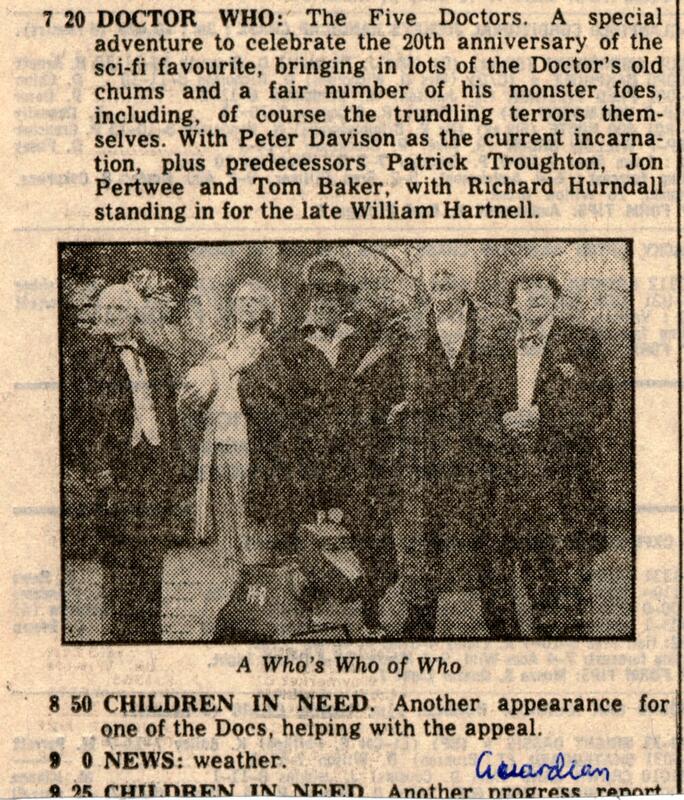 With Peter Davison as the current incarnation, plus predecessors Patrick Troughton, Jon Pertwee and Tom Baker, with Richard Hurndall standing in for the late William Hartnell. 8 50 CHILDREN IN NEED. Another appearance for one of the Does, helping with the appeal. APA 6th ed. : (1983-11-25). The Five Doctors (The Guardian). The Guardian . MLA 7th ed. : "The Five Doctors (The Guardian)." The Guardian [add city] 1983-11-25. Print. Turabian: "The Five Doctors (The Guardian)." The Guardian, 1983-11-25, section, edition. This page was last modified on 15 March 2014, at 10:20.